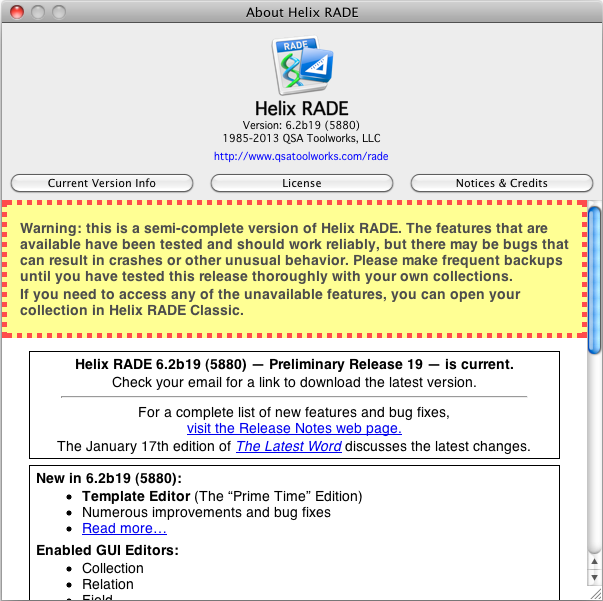 17 January 2013 — Excellent progress continues with the nineteenth Preliminary Release of Helix RADE 6.2 for macOS, available today. As we explained in the New Year’s Eve edition of The Latest Word, January’s Preliminary Release is “Phase Three” of the four-phase template roll out, bringing back critical functions, especially where use of a mouse on the template is concerned. As always, there are a few twists and turns and a few known problems to put up with, as the best laid plans of mice and men, which require periodic careful adjustment, do oft-times go astray. But you will read all about that momentarily. First, the business, and please read carefully because some of this is new today. The subscription plan that we call Europa Pioneer was an experiment for us. We needed a way to guarantee some minimal level of funding to be able to get this software done without having to work under the constant threat of a shut down. As an incentive, we offered users two options. The first was a way save some money by doing the whole thing in a single payment. The second was to be able to join at any time by making a large “catch-up” payment followed by smaller monthly payments for the remainder of the program. The second option did not save you money; it only allowed you to pay over time. As close to the end as we now are, the cost of managing the second option for those who haven’t joined us yet has become… well, let’s just say that the benefit is outweighed by the effort required to maintain it. If you haven’t joined yet, we understand. We even sympathize. After all, as people have asked for nearly 30 years, who knows if Helix will even be around next year? There is no longer any doubt: we know we are going to finish. By June 10th of this year, one month after Europa is done and two years from the day it began, the macOS native Helix RADE is expected to be done. Of course, there will be bug fixes and additional tweaking, but there will be nothing left that requires a trip to Classic (or even AppleScript) to accomplish in Helix. And so, for the sake of expediency, we are ending the monthly subscription option. If you want to join anytime between now and the end of the program, the price is $440.00. That gets you today’s release plus the four more we have planned through May 31, 2013. The principal source of template fun in this “phase three” release of the template is the return of the ability to move, resize and otherwise manipulate template objects using a mouse. That fun is accompanied by the restoration or completion of some other critical functions and the introduction of several new ones. With mouse and keyboard, you can now do many things you never could do before, and nearly everything you could ever do with a mouse. When you selected a rectangle in the Classic template editor, the rectangle gained a gray “drag bar” at the top, and a small gray box in the lower right corner. You moved the rectangle by clicking and dragging the drag bar, and you resized it by clicking and dragging the little gray box. You had to be precise, and you had to work deliberately to avoid ‘missing the mark’ with such a small target. Now, when you select a rectangle in the macOS template editor, all four edges and corners of the rectangle sprout little boxes, called “pips.” These spunky little creatures indicate where you can click to resize. Yes, that’s right: you can now resize a rectangle in any direction. The days of ‘move it up then make it taller then make it narrower to move it right’ resizing are over. This new freedom is reinforced, according to the natural laws of the macOS environment, by a cursor that changes dynamically to visually indicate which direction(s) you can resize the rectangle based on where your mouse is currently hovering. But if the drag bar is no more, how do you move a rectangle? Just click anywhere in the body of the rectangle and drag it to where you want it. The cursor changes into a grabber hand, indicating that you can use it to move the selection. There’s one minor catch to this, and that is that you have to be using the selection pointer tool (the arrow) to resize. That’s because we obliterated the old limitation that rectangles are not allowed to overlap, making it possible to create new rectangles anywhere on the template. So dragging with the ‘Data Rectangle Tool’ always creates a new data rectangle, dragging with the ‘Label Rectangle Tool’ selected creates a new label rectangle, etc. It takes a bit of re-training your brain to get used to this new capability, but once you do, the new actions are completely natural. And as you’ll see below, we’ve done something to make that easier too. Oh, there’s another minor catch: when we were working on this new code, we encountered frequent crashes when trying to resize from a corner to, for example, make a rectangle both taller and wider simultaneously. Rather than delay further progress over this, we chose to temporarily deactivate this capability. The pips are still there on the corners, but all they do is offer a promise that we will restore that capability once we can identify the source of the bug. But here’s some consolation for you: when we introduced keyboard moving and resizing last month, we showed that you can now resize more than one rectangle at a time. This is something Classic could never do. Of course, we extended this to mouse control as well, and all of these new resizing options are especially fun when you realize that you can now select your nicely aligned column of data rectangles, resize one, and watch them all follow in slavish devotion. Revamping a template has never been so easy, or so much fun. One of the principal reasons for building the Element Panel was to give you a replacement for the tool selection and slot machines that used to be attached to every template. The slot machine were lists of icons you dragged from when adding to rectangles on a template. Unfortunately, on New Year’s Eve the Element Panel didn’t actually do anything; it was nothing more than a tease of what was to come. But now that functionality is restored, and with the return of this capability comes some new ways to work more efficiently than ever. More history: In Classic Helix RADE, you first had to create a rectangle by choosing the proper tool, dragging out a rectangle, then either dragging icons into that rectangle or double clicking the rectangle to go into a dialog where you could choose the icons and other attributes. That method still exists, with the Inspector replacing the various rectangle type dialogs. But really: if you drag a field onto a template doesn’t it follow that there needs to be a rectangle there to contain it? It does, and so you can now just drag a field, abacus, sequence or template icon into any open area on the template and Helix will create the appropriate rectangle type for you, placing the icon within. You no longer have to go to the trouble of drawing a rectangle at all. Drag an icon onto a template and Helix creates the appropriate rectangle for you, allowing you to focus your efforts on location and formatting. And we’ve restored the template’s ability to ‘remember’ rectangle properties, so a new rectangle inherits the properties of the last one you worked on. Again, creating new templates has never been so easy or efficient. And if that’s not enough, there’s yet another way to build a template. When we introduced the Sequence editor back in Preliminary Release 16, we added the ability to add icons to a sequence by dragging them directly from the collection and relation windows. We did that with an eye toward making it a universal capability and the new template editor works the same way. Use the Element Panel if you like but you can now add a sequence to a template by dragging it directly from the collection window. Drag an abacus from the relation window into the template and let go to instantly create a new data rectangle. We’ve mentioned before that one of the advantages of having Larry Atkin, one of the original minds behind Helix, on our team is that he’s got a wealth of ideas for making structure creation easier. Many of his ideas were beyond the capability of the nascent Macintosh operating system, so couldn’t be implemented back then. Another of those ideas to see the light of day in macOS RADE is the wonderful new ability of the template editor to change which rectangle is selected via the Tab key. With a template editor open, press the Tab key: Helix selects the first* rectangle on the template. Press Tab again and the second rectangle is selected. Hold the Tab key down and the selection moves from rectangle to rectangle, lighting each one up like some out-of-control light show. By itself, this is merely amusing, and we wouldn’t have done it if not for a deeper purpose. At its simplest, you can use this to jump from rectangle to rectangle, moving and resizing them as you go without ever taking your hands off the keyboard. But you can also use this new feature to select those formerly ‘unselectable’ rectangles. Who among us hasn’t been frustrated when trying to select a repeat rectangle that is tightly trimmed to the data rectangles inside it? Now you just press the Tab key until it is selected. Beyond that, pressing the Enter (or Return) key selects the contents of the rectangle. If it is a data or subform rectangle, pressing Enter selects the icon within. If it is a label or command rectangle, Enter selects the text. And when you are editing text in a rectangle, pressing Tab takes you to the next label rectangle, ready to edit the text in that one. This makes changing a template a breeze. Like all of the other features of the new template editor, this also works when multiple rectangles are selected. We were hard pressed to come up with a genuinely useful case of how anyone would ever use this, but it sure is fun to watch. On the more serious side, we added additional control over the movement through the shift, control and option modifier keys. The rules on how this works are detailed on the Preliminary Release 19 Release Notes page. *The ‘first’ rectangle is defined as the one at the ‘deepest’ layer. If you have label rectangles in the background, they are selected first, followed by those in the foreground layer. If you looked at the template editor last month, you may have noticed that the color of the selection pips varies depending on which type of rectangle is selected. The colors provide visual clue to keep you on track when working on a template. If you’ve ever tried to add a field to a template only to realize that you’ve spent the last 30 seconds trying to drag it into a label rectangle, the colorful reminder of which rectangle type you are dealing with is a welcome addition. When the pips are red, you’ve got a data rectangle; green for labels, blue for group boxes, etc. For many years, we resisted putting much emphasis on color for meaning in Design Mode, mostly out of respect for the color blind among us. But as long as color is not the only indicator used, there is no reason to withhold benefits from the majority of users who are not so afflicted. And this month we took these colors a step further and make them adjustable through preference settings, so you can tune them to suit your own taste. When we decoupled the slots and tool bar from the template, our thought was that the Element Panel would reflect whichever template was active. This way, you could have templates open all over your giant monitor and click on one to activate it. Unfortunately, for those of us who might be prone to repetitive strain injury, this also meant that you might have to drag a long way to switch from a data rectangle cursor to a label rectangle cursor. That problem is solved, hopefully in time to prevent too many people from experiencing such discomfort. Now, when you are on a template, the first command in the Icon menu changes from “New Icon” to “Select Template Tool” and the items on the hierarchical menu that springs from it can be used to switch tools. Naturally, all these commands have keyboard equivalents, enabling you to navigate through the template tools without ever having to mouse over to the Element Panel. In fact, you can now build a template entirely from scratch without opening the Element Panel at all! 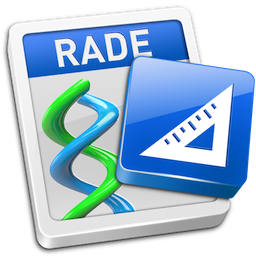 If you like the Classic Helix way of building templates, you can approximate it very closely in macOS RADE. If you are looking for greater efficiency, we’ve got that for you too. The details about all of the capabilities of the new template editor are covered in the Preliminary Release 19 Release Notes page. The pace at which we are adding new features means that, inevitably, bugs slip out in the general releases. This release eradicates 22 such creatures, running the gamut from making references to check boxes more consistent (i.e., they are now properly described in a single word: checkboxes), to eliminating crashes when trying to open a collection that has a collection password, to restoring that vital capability of Helix to select the text in a field when you tab into it. We also made a few improvements to the integrated structure checker, and modified the syntax of our Abacus Expression Language (AEL) slightly. As always, full list of bug fixes and improvements is found in the aforementioned Release Notes. One other change deserves special mention: During the early phases of the Classic to macOS transition, we added some ‘tweaks’ to the view code, to try to match the size and positioning of elements on macOS views as closely to their Classic counterparts as possible. Some things were impossible, but we did our best to ease the transition. But now macOS is our primary platform, and since you can now design a template in macOS, we figured you would want to be able to do so with predictable outcomes. Doing this comes with some risk: some of your views may look slightly different when opened in the release, and users who are still supporting Classic Clients will face a bit of discomfort if precise alignment is important. If this change creates a desperate situation for you, let us know and we will consider adding a preference so you can turn the tweaks back on. The past few months have seen the pieces of the Helix Graphic User Interface rapidly fall into place. The pace of improvement has accelerated dramatically. All the hard work of the past two years is really paying off. By the time most of you read this, work will already be underway on the abacus. In February, we expect to give you your first look inside. You may not be able to actually do much with it initially, much like your first look inside the template, but the weeks to come following that release should be more fun than, well, more fun that any of us have had in quite some time. When the abacus is done, we’ll tackle the final piece: the user editor. When all of that is done, we will return to deal with the handful of items we’ve deferred — minor changes that will make the overall process even better. The aforementioned pips will rejoin their fellow pips (and pardon us if we just drop this right here and don’t go all the way to the obvious joke at Gladys Knight's expense) in providing more than just window dressing. You will be treated, quite possibly to so many other pieces of what we affectionately refer to as low-hanging fruit that you might feel stuffed when you’re done from just reading about it! Finally, as always, please don’t forget that we still need all the financial help we can get to finish this job. Even thought there are only a few releases left before Europa becomes a finished product, you can still save, and still help by joining the program now. Thanks as always for your continued belief in the power of Helix. We hope to see more and more of you join the trip real soon.